If you had asked me where the most beautiful scenery in Istanbul is, untouched by the human hand; pure and virgin, distant from any civilization, I would have answered you without any hesitation : It is the mouth of Bosphorus where its waters flow to the the Black Sea. Here, seen from the hills of Rumelifeneri on the European peninsula or the Anadolu Feneri on the Asian side, Bosphorus and Black Sea have a fantastic view. Unfortunately with the construction of the third Bosphorus bridge between the two shores, soon the surrounding green hills will turn into concrete roads, highways and viaducts. 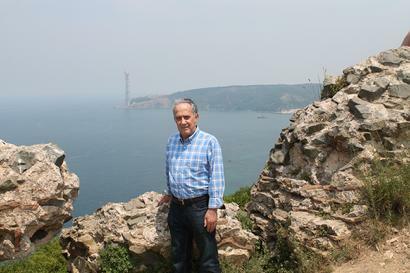 It was over ten years ago when I first climbed up the hill in Anadolu Feneri and visited the Yoros Kalesi, the old Genoese fortress and felt like I was on a summit in the land of giants. 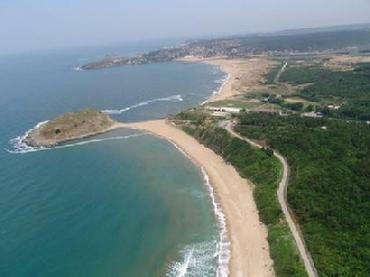 On the north side of the fort a rocky hill was declining sharply to the rough waters of the Black Sea. On the West the lighthouse of Rumelifeneri was hidden behind the hills and in the South the blue waters of Bosphorus, like a long bed sheet, were crawling endlessly towards the horizon.There was not a single trace of civilization to be seen on either one of the continents, and looking down from top of the hill everything looked so grand in size that one would feel like Zeus in the land of giants. According to the Greek mythology when Jason, the leader of Argonauts stopped here on his return trip from the search of golden fleece, he built a temple here to honor Zeus and the other twelve Greek Gods. The temple was called Hierion or the sacred place. According to another belief the temple here was named after Poseidon, the God of winds while others argued that it was named after Zeus Ourios (Zeus, granter of fair winds) because the strong winds blowing from Black Sea always slowed down at this temple and turned to into milder winds. In the previous chapter I talked about my trip to Rumelifeneri and the clashing rocks of Kynea or Symplegades, which the 16 th century traveller Petrus Gyllius mentions as the European Kynea in his book De Bosporo*. Petrus Gyllius got his information about these rocks from the book Anaplous wrıtten by the Byzantine historian Dionysius. According to Dionysius there was also an Asian Kynea, a small Island with rock formation. Gyllius wrote in his book that these rocks were not visible from the European side or the island looked like it was attached to the mainland. Gyllius apparently tried to reach this island with a boat trip from the European side but because of the rough weather he had to take refuge at the site of the Zeus’s Hieron. From here Gyllius decided to walk through the woods and bushy hills to be able to see not only the rocks of the Asian Kynea but also the river Rhebas (Riva Nehri), which Dionysius called the most beautiful river in the world. Walking on foot he reached the river running into Black Sea and the island in the shape of an onion called Krammyon, separated from the mainland by a thin water passage. There is also a second island on the other side of the Rhebas river called Atraparion across the shores of Greek village where some farmers were living. While he was looking at these islands from top of the hills, he saw some boatmen rowing their boats on the stagnant waters of the Rhebas river. These were the gardeners working for the Ottoman Sultan, tending the vegetable gardens on the shores of the Rhebas River in the district of Gebze by the Ömerli village, about seventy kilometers away. Buy offering some money, Gyllius convinced these inexperienced boatmen, whose only maritime experience was to sail in the calm waters of the Rhebas river, to sail to Black Sea and to take him to the Krammyon Island. But a sudden storm broke and high waves started hitting the island all the way to its highest point, causing the beach to flood and the water passage between the island and mainland to difficult to pass through. The boat with its crew of twenty was in danger of capsizing, some of the boatmen lost their paddle in the water, while others were praying loudly and yelling “Allah, Allah”. When they finally reached the shore, the boatmen were very angry and threatening Gyllius with his life. To save his life from the angry sailors he gave all of the money he had in his pocket to the angry boatmen so that they can buy some yogurt from the nearby villages and calm themselves down. Gyllius spent the whole night there in the cold weather on the beach by the Rhebas river and in the morning walked back to the Hieron of Zeus, to sail back to Istanbul. Gyllius wrote in few different chapters of his book that on his return trip from Black Sea, the Argonauts leader Jason had replaced the old iron anchor of his ship Argo, with a stone anchor at the peninsula by the Rhebas river. According to the Byzantine historian Dionysius that is why the area was called Ankyrorion. Also Dionysius mentions in his books that the fort on the hill by the Rhebas river was built by the Genoise like the one on the Zeus Hieron close by, for the surveillance of the Bosphorus- Black Sea traffic. 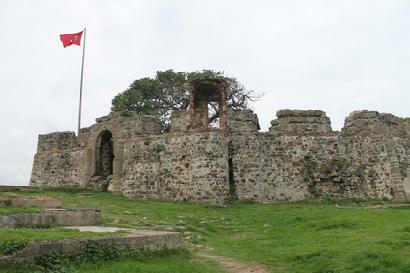 But some Turkish sources believe that Riva Fort which still exists in ruins today was the work of the Ottomans since its walls from cut stone and the arched partitions and huge cellars point to typical Ottoman architecture. in the rest of this area. On my last trip to Istanbul I fulfilled my wish, thanks to my fiends, the Zeren couple who took me to the hills of Bosphorus with their car on a Saturday afternoon in early November. We first traveled through the highways, passing several traffic bottlenecks by the viaducts of the Fatih Sultan Mehmet Bridge on the Asian peninsula and then started taking the countryroads down the hills to the Black Sea. Riva is a small fishing village, with a little mosque which has a single minarete, a bridge over the Riva river, the ruins of the little fort on a hill, and few seafood restaurants. 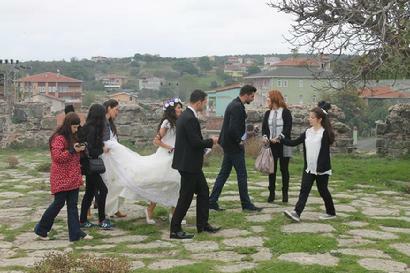 Riva has always been a popular spot for Turkish movie makers since decades and continues its popularity with TV series nowadays and also the fort overseeing Black sea is prefered by newly weds for wedding pictures. After parking the car we first walked to the little hill where the the ruins of the Riva Fort was and enjoyed the breathtaking view of Black Sea and the empty beach with its yellowish sand laying in front of us. At a distance behind the hills we could see the foot of the new Bosphorus Bridge being built. All what was remained from the fort was a platform where we stood and enjoyed the view, broken brick and stone walls, few arched gates and the dungeons underneath of us. 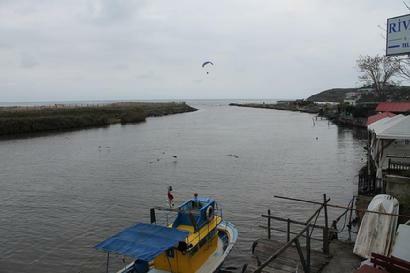 On the opposite side of the Bosphorus, the Rhebas river, now a stream with a dark grey water in this November afternoon, was flowing into the darker waters of the Black Sea. While we were leaving the ruins a wedding party was walking up the hill with the bride in her white dress and the groom next to him, followed by their family and shooting crew, for taking wedding pictures. We were getting hungry and my friends started searching for the best seafood place whıle I went up to the little bridge over the river to take some pictures. 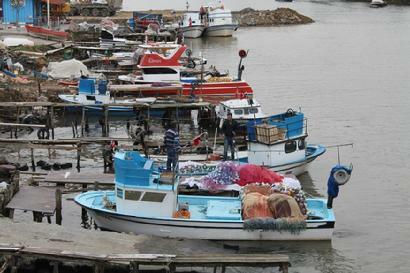 On the inland side several fishing boats were docked with fisherman getting ready for their next trip. On the other side by the beach, I recognized in the distance the little island of Krammyon, the Asian Kynea where once Gyllius tried to land but almost drowned in the storm five centuries ago. My friends had picked the Kalyon Restaurant between the two seafood restaurants by the river and were waiting for me to pick the mezes. The mezes were delicious appetizers like: shak shuka, fried eggplant cubes with garlic yogurt, stuffed zucchini, pastrami borek baked of filo dough, different season salads and many many more. As the main dish we had grilled blue fish, fresh out of the ocean accompanied by a small bottle of Tekirdag Raki. We watched the Rhebas stream, the ducks with their green heads swimming in the water, the wild geese flying over the water , an old fisherman sailing with his tiny boat to the Black Sea. We talked about my family and my daughters and granddaughters and their daughter back home in Columbus Ohio, whom we considered one of our own. We talked about my trips in Istanbul and Jason trip here by the Rhebas river and the old anchor he left here. When it all ended we took the scenic Bosphorus road by the sea side, driving into heavy Saturday night traffic. It took us more than two hours to reach Kadikoy, but I thought every minute of it was worth it.